Disability, Gender and the Trajectories of Power is a collection of articles written by authors and activists working on the larger issues of disability and gender. The volume makes a valid argument for considering rights of disabled women from an intersecting lens and advocates for a two-pronged action to be taken up both in terms of inclusion in policy and eradication of exclusion and stigma from the lives of women with disabilities. The book is divided into three sections that speak to one another in terms of academic and advocacy content. They point to different levels of engagement with the issue at hand—from using existing data to elaborate the poor status of women with disabilities to highlighting the lack of gender-disaggregated data, from illustrating personal experiences of restrictions faced by disabled women in India to interrogating the gendered nature of discrimination faced by disabled women in different realms of life, from engaging with notions of motherhood to elaborating experiences of care. 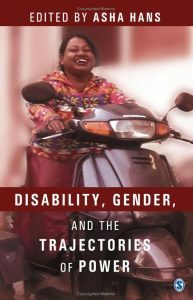 In the introduction Asha Hans points towards the need for gendering the disability framework as gender inequality and injustice enters lives of women with disabilities in many ways. Highlighting the nascent field of Feminist Disability Studies in India, the book points to the need for more transformative research to bring in evidence-based data. The book successfully makes the case for advocacy to ensure more evidence-based research on the status of disabled women and using the research findings for further advocacy. The normative foundations of democracy, although espousing equality of all citizens, often ignore the ways in which different identity-markers can confound the access to justice of different marginalized groups. In this volume, all articles explore the intersections of gender and disability with the present socio-cultural and political framework to interrogate not just access to justice but also the very framework of gender and disability politics. The articles in the book speak to one another, from the way in which the editor has grouped them into sections but also in the way there are commonalities across sections within the book itself. The engagement with rights cuts across—­not just the rights of all persons with disabilities, but within impairment categories, different disabilities and the issues around social interpretations of different conditions, especially those with intellectual impairments and psycho-social disabilities; rights of all kinds and not just civil-political rights, but also the right to legal capacity, right to work and right to live in the community; rights of other groups implicated in the lives of disabled people—of mothers and of families, too. The common binding thread is also the analytical frame—interrogating sociological and structural forms of oppression resulting in systemic discrimination and latent violence. Using both patriarchy and ableism as directional contexts, the articles connect intersections—gender and disability with families, labour, social inclusion, education in various ways. The interlinked articles on mothers and mothering are very interesting—the focus on mothering and motherhood, exploring giving birth, rearing a child and its social ramifications—have served to unify the experiences of all women, disabled or not. While the birth of a disabled child in urban areas is often being subverted with the use of technology and legal mechanisms, it sends out a clear social message about the unacceptability of disabled people within families and societies. On the other hand, mothers with disabled offspring highlight the experience of mothering a child with disability within a social context that is largely negative towards disabled people, as both harrowing and satisfying. The notions of care implicated in the social ideologies of motherhood and mothering are equally important for mothers of disabled children as for disabled women who seek to be mothers. For disabled mothers, struggles of becoming a mother and of being a good mother in terms of care and nurturance, create pressure both at ideological and practice levels. The other focus on women with psycho-social disabilities is also a welcome one as there is very little discussion about the stigma and discrimination faced by these women. While the medicalization of mental illness often means psychiatric oppression, it also means the alienation of such labelled women from their minds and bodies, and breeds discrimination in terms of engaging in gendered and abilist struggles. Concomitant factors like poverty, globalization and medicalization contribute to increasing inequality and exclusion from society and social movements. While the state is somewhat unwilling to take responsibility, social and legal oppression of these women becomes clear in debates around legal capacity and civil-political rights. The struggles for full-fledged legal capacity in India, both within normative social structures and at level of civil society and different movements, need to be highlighted. State legal provisions in India often render legal capacity contextual and problematic, and erect the highest hurdles for women with psychosocial disability. Another connect is evident in the chapters on education and work of women with disabilities. While one essay uses quantitative data to highlight the restricted access of disabled women to entitlements, other articles point to the link between poor access to education leading to scant employment opportunities. While women with different disabilities are affected, women with intellectual impairments are particularly marginalized and deprived, with the barriers to inclusion being multiple—social, attitudinal, cultural, structural and legal. The segregation of disabled women in medical institutions, special schools and sheltered employment highlight the multiple intersections of gender and work, which ensures that disability pauperizes in distinctly gendered ways. The book provides fresh insights into lives of women with disabilities and their families, with focus on the struggles against state and society that are shaping the contours of identity of women—both in terms of experiences and consciousness. There is a clear message for transforming collective knowledge and revolutionizing the ways of engaging with the world around us. The essays highlight discrimination yet left unattended despite UNCRPD (UN Convention on the Rights of Persons with Disabilities) and activism, and call for bridging the gap between academics and activism, stressing that research on lives of disabled women should highlight major deprivations and be further utilized for sensitizing state and society. This parallel and mutually interactive process as reflected in the activist/academic framework of the book will help build convergence with various social movements and stimulate both policy and practice-level change. Nandini Ghosh is a sociologist working at the Institute of Development Studies, Kolkata. She has graduated from Presidency College Kolkata and did her doctorate from Tata Institute of Social Sciences Mumbai. Her core areas of interest are gender, disability and study of marginalized groups.